The following is an edited transcript of the webinar. 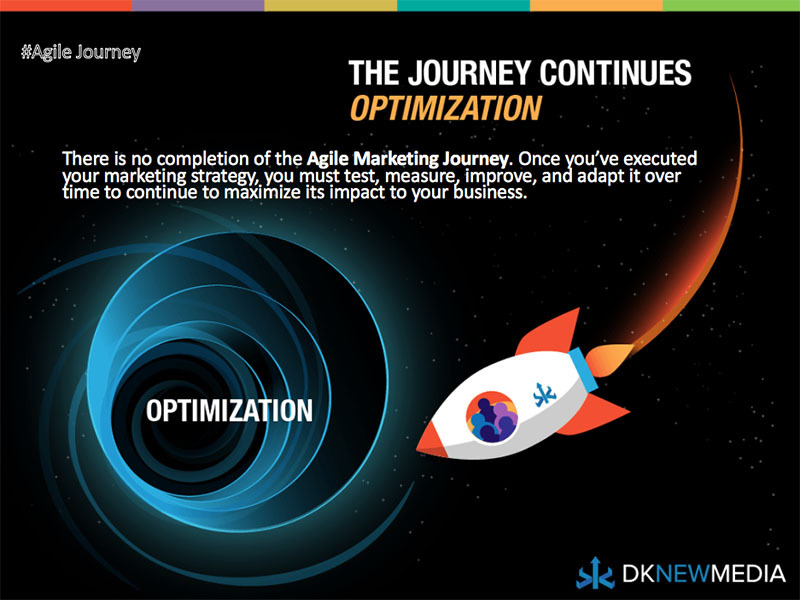 You also can see a slideshare of “The Agile Marketing Journey” available via DK New Media and a related infographic available via MarTech Zone. Use the anchor links below to jump to the transcript section that correlates to each slide in the presentation (slide #s in parenthesis). Meagan DeMenna: Hi, and welcome everyone. My name is Meagan, and I’m the Community Manager here at ClearVoice. 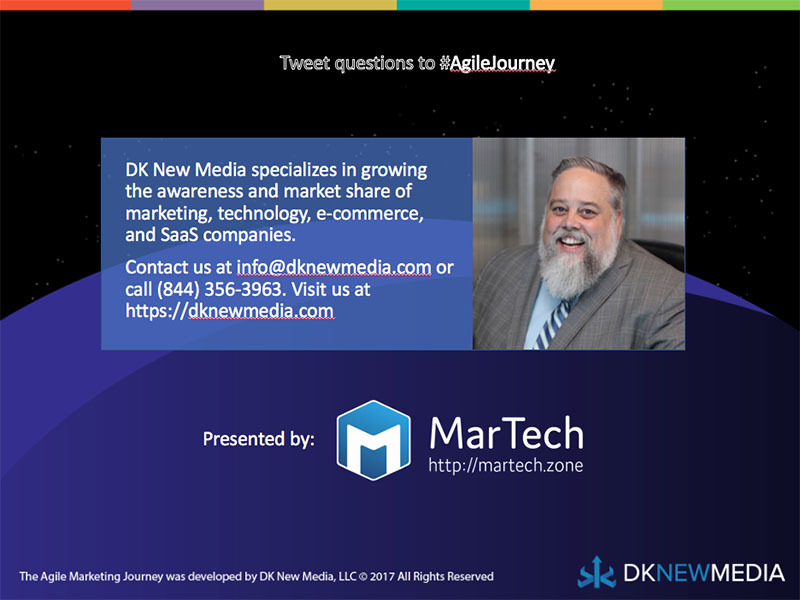 Thanks for taking the time for today’s webinar “The Agile Marketing Journey” presented by Douglas Karr, of DK New Media. Before I hand things over to Douglas, I just have a few things I’d like to mention. The recording of today’s webinar will be available this afternoon on the ClearVoice YouTube channel. We will also send everyone who registered an email with a link. At the end of the presentation we’ll be happy to take any questions. If you take a peek at your webinar’s interface, you’ll see a question outlet where you can send in anything you’d like me to ask Douglas. Feel free to send your questions in throughout the webinar. 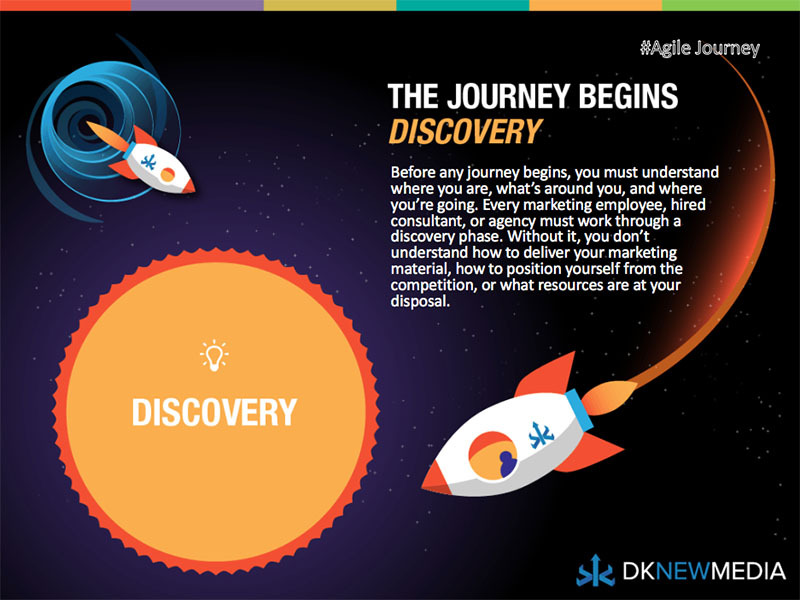 You may also tweet your questions using the hashtag #AgileJourney. So, Douglas, I’ll let you take it from here. Douglas Karr: Fantastic! Thanks so much, Meagan. Welcome everybody, really excited to do this presentation with you. If I sound a little stuffed up, it’s ’cause I was out in Vegas and got a cold somewhere along the way, but just bear with me. I guarantee I’ll mute if I decide to sneeze on you. This presentation is really important to us and to our clients. We’ve worked with a number of clients on content strategies and social media strategies, search engine optimization strategies in the digital marketing space. And over the last decade we have developed kind of this pattern where we see success. So we wanted to share that with everybody else, and we put together this beautiful infographic — and it fits directly in with what ClearVoice is trying to achieve with their software as well. So without further ado I will get going. Douglas Karr: So the first thing that I want to talk about are four key threats that organizations are seeing. For you poor marketers out there I know that you’re overwhelmed, and there’s 4,000 or 5,000 tools out there to utilize. And typically it’s, you know… Everything’s digital. So it’s cheap. So your organizations decide to cut staff and cut resources, when in fact the number of things that you’re trying to achieve are much greater. 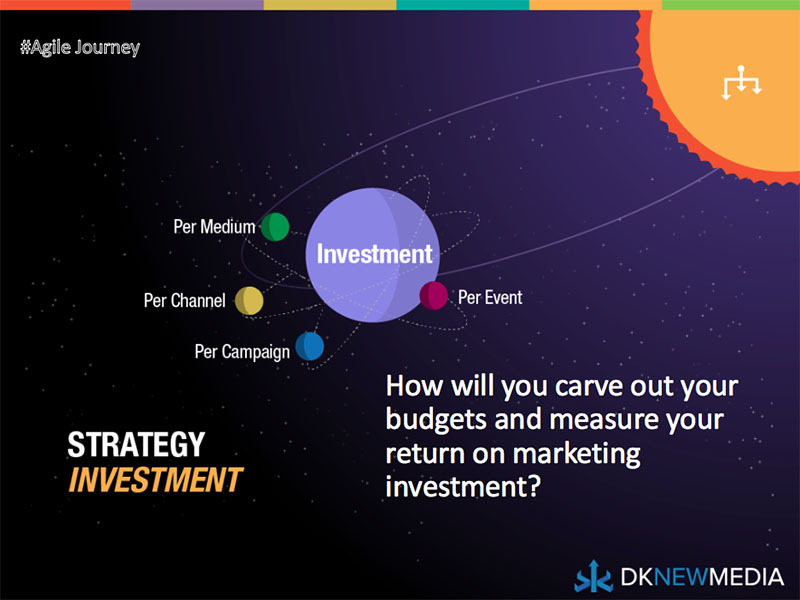 Marketers lack clearly defined goals and direction. Less than half said they’re extremely confident in their organization’s ability to achieve its vision for growth, and 4% weren’t confident at all. Marketers struggle to unify a cross-channel digital experience. And I’m sure you guys see problems with that, now that we have Facebook and mobile and search and social and, you know, Snapchat and Instagram and everything else that they’re throwing our way. So marketer’s are definitely seeing a greater performance on their campaigns when they’re able to unify cross-channel experiences. But they might not have the tools or the resources to do that. So only 51% said that their organization addresses user needs across all platforms. 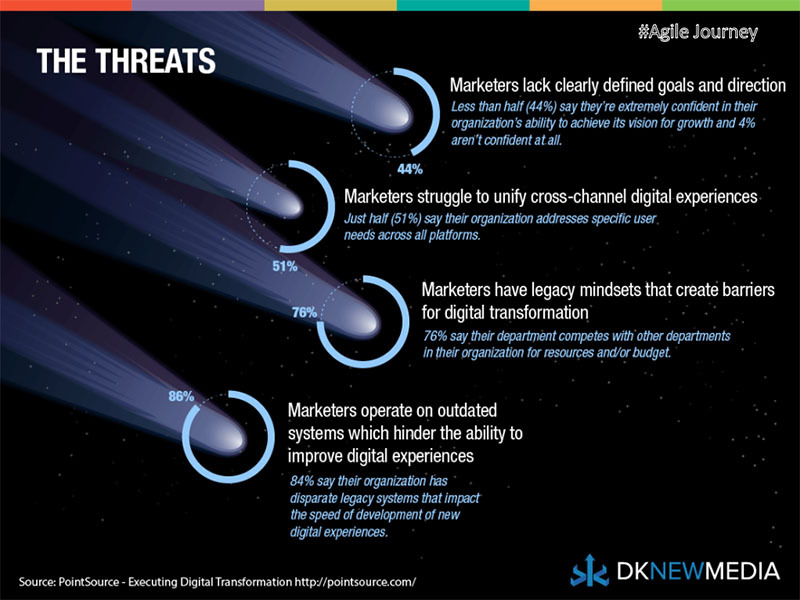 Marketer’s tend to have legacy mindsets that create barriers for digital transformation. So 76% say their department competes with other departments in their organization for resources and budget and being a marketer. All my life I know that marketing often finds itself at the short end of the stick there. Marketers are operating on outdated systems, which hinder the ability to improve digital experiences. Now, of course, this is an informative webinar and I don’t want to do a sales pitch here and everything else, but ClearVoice is a good example of that. It’s a modern software. But if you weren’t aware of it, you’re really missing out on some of the process and efficiencies that it can build for you. And what happens over time to many organization’s is they continue to use the same tools over the last decade, and they really miss the opportunity to see these new tools that are coming out, that are far more efficient and maybe even less costly than what they’re using currently. Douglas Karr: So, let’s get on our journey. Now in the top left you’re going to notice a little wormhole with a ship coming out of it. We’re going to address that at the end of the presentation. But, basically, when we’re working with clients and coaching clients to their success, the first thing we want to do is go through a discovery phase. So you really want to position yourself from the competition, position yourself as the competition and really look at what you have to offer, and what you can really go to market with. Douglas Karr: So the first phase of discovery is: We look at the market. And so we’ll look at the audience. Obviously, internal customers versus potential customers and prospects, and we’ll do persona research and identify what these people look like; whether there’s major groups associated with them, what do they have in common, what don’t they have in common, and really get a clear picture of that. Then it’s the market understanding. We want to understand what the market share is of the company that we’re trying to work for and who owns that market. How much money are they spending? You know, basically, what we’re up against. And a lot of times that will shift our thinking, as we go down the journey, about what we’re going to do because we might be up against a mammoth customer that has millions, or tens of millions, of dollars in marketing expenses and we just can’t compete there. So we have to look for other ways.The last is competitive analysis. And that’s really looking at a SWOT analysis of your own company — what are your strengths, what are your weaknesses; what are the opportunities; and what are the threats to your company — and get those defined so that we can then utilize those within our strategies. Douglas Karr: Then we move over to brand. Most of the companies that we’re working with already have this set up. If they don’t, we actually institute brand exercises to get this laid out. But we want to know from a voice and tone what they sound like. We want to understand from visual styling, obviously, like a logo, color schemes, if it’s video, what do they want to look like on video? And then we want to make sure that that messaging, that brand alignment, is across all of their messaging. Whether it’s their billing system, or it’s the collateral that they’re putting out, or it’s the website. We want to make sure that all of those are unified throughout. Douglas Karr: Then here’s the biggest one: It’s we want to look at the time, talent, and other resources that the client has. So we want to understand: Do they have development resources internally, if we want to do integration or automation? What campaigns are they constantly running or have to be running on an ongoing basis? What’s their budget? And then what’s their budget as a more importantly what’s their budget as a percentage of revenue? So if you can look at your revenue and understand, hey, marketing is let’s say — like in the software service industry — it might be 5 to 8% of overall budget. But if a company really wants to grow aggressively, they might have to make that 20% of overall budget and keep that going. So we like to look at budget as a percentage of revenue rather than just a flat fee associated with it. 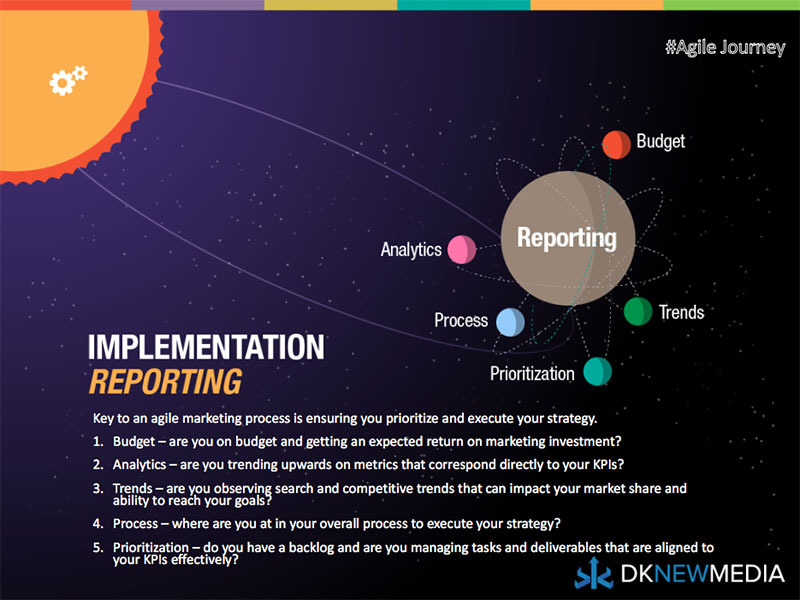 Because as your company grows and as it builds momentum with your agile marketing strategy, you can continue to expand and accelerate your growth from the marketing side as well. We want to understand what kind of employees you have internally. Is it one employee that’s overworked and going to 30 hours of meetings a week? Okay well then we need to work with agencies or consultants, you know, to get that stuff done. And all of these are going to determine where we move within our strategy. Which, of course, brings us to our strategy. Douglas Karr: So now that we know that we have all the tools and we have the resources associated with our company, now we’re going to just start to develop a baseline strategy used to achieve those goals. We want an overview of the goals, the channels, the media, the campaigns, and how we’re going to measure success. We’re going to create an annual mission statement of in, you know, 2017 we’re going to achieve X, Y, and Z, and then we’re going to break that down into a quarterly focus. And then even from the quarterly focus, then we’re going to start rolling out tasks and calendaring and schedules to monthly or weekly deliverables. This is really the agile part of this. We’re going to talk about agile marketing more and more through this, but this is where we have some flexibility. As long as we have our eye on the prize on what our long term goals are we can continue to shift and prioritize based on the performance that we see. 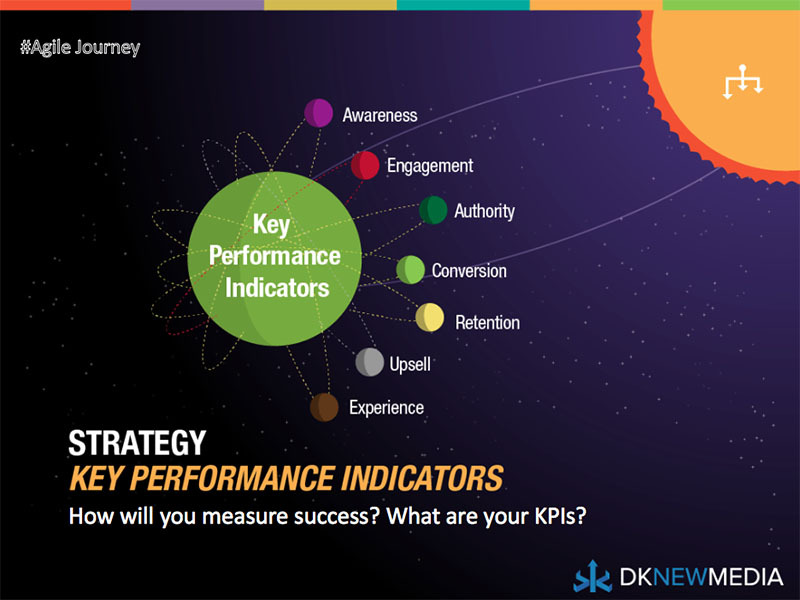 Douglas Karr: The first part of developing your strategy is understanding what are the key performance indicators that we want to absolutely measure with our strategy. So it might be if you’re a young company, it might be that nobody’s even aware of you. So you just might want to build awareness. It could be engagement. If you can correlate activity on, let’s say, Instagram to people that are purchasing your products or services, then engagement might be a KPI. Authority is a typical KPI that we’re working on from a digital marketing aspect, and there’s kind of two fields there. There’s authority, personal authority that you have leaders in your organization, that you want them to be seen and identified as leaders within their industry; and then there’s of course search engine authority… And that’s that we want search engines to identify your domain as a subject matter expert for a certain thing. And we’re going to monitor that with ranking. Of course conversions. Are we converting our visitors to subscribers? Are we converting our subscribers to leads? Are we converting our leads to customers? And then are we retaining those customers? Are we upselling those customers? And then a new one that you might see in here a lot nowadays is experience. The reason why customer experience is starting to fall within the scope of marketing is because if you have a poor customer experience, obviously on social media it’s going to get out there. 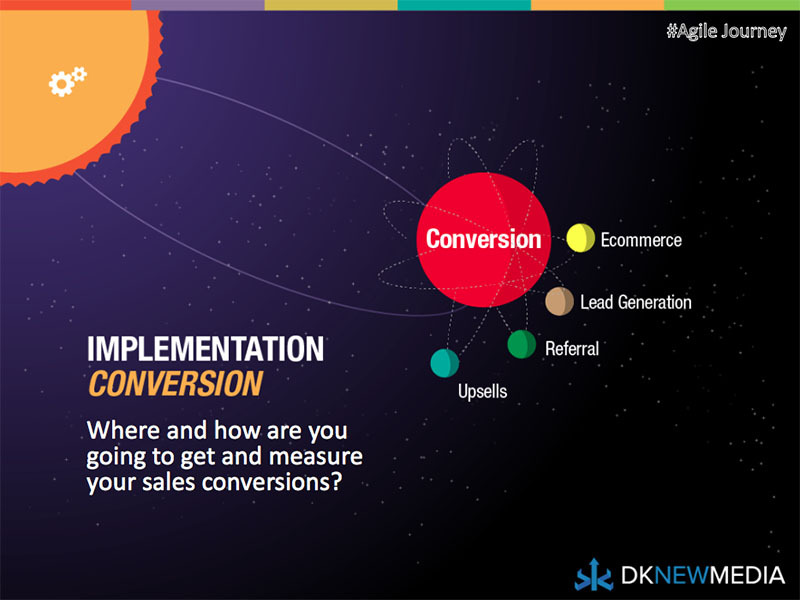 And that’s going to impact all of your conversion metrics and your KPIs, if you can’t fix that. So we want marketing to have a hand in what the customer experience is like, and we want to make sure that they’re knowledgeable of: Are we improving our customer experience? Or is it getting worse? Because that’s going to impact our success or failure from a strategy standpoint. Douglas Karr: Now we’re going to look at media types, and we’re going to identify what are our own media types — those are our digital assets that we own and our social channels that we control. We’re going to look at earned media. Now these are media resources that own or connect with your prospects or customers. So they might be a newspaper online or a relevant industry publication where they own the audience but you want to reach them. Then we have shared media. 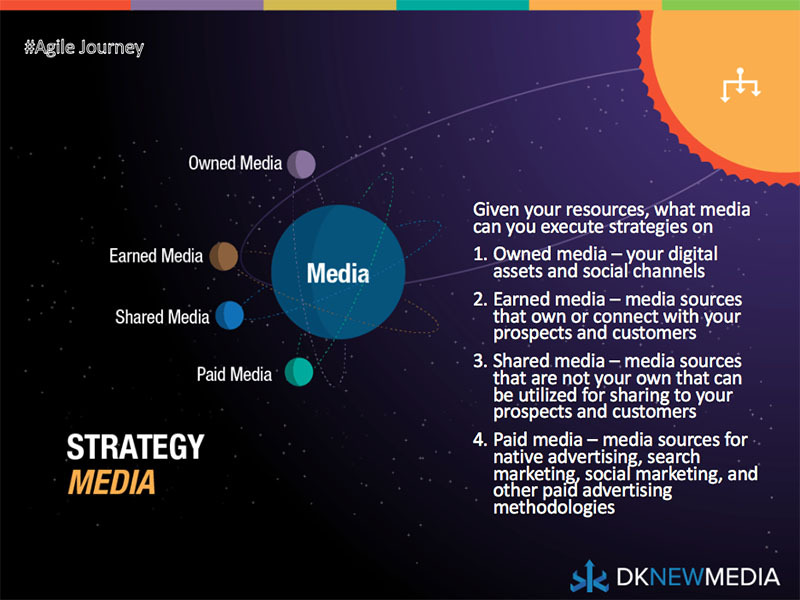 Shared media resources… They’re still not your own, but you can utilize. So Facebook, for instance. If I have a Facebook group up, that’s a great shared media group that I don’t necessarily own (Facebook owns it), but I can expand my reach. Then paid media… And paid media continues — that’s where Facebook and everybody continues to try to shove us, right? They want to own our audience or customers, and then they want us to pay them to get access to those. And paid media isn’t a bad thing, but it’s often the most expensive cost per lead. Douglas Karr: We want to identify what are the initiatives that we’re going to be pushing. Are they ongoing initiatives like search engine optimization, where every single month we might be tracking ranking and looking at how competitors are doing compared to us? Are we going to continue to produce premium content that drives authority and ranking? And then we’re going to look at, of course, campaigns. And that’s so we want to understand from a seasonality standpoint and from a periodic standpoint what pushes are we going to be out there. And then we want to look at events. Events — and it might be in person events or it could be an online webinar like this is — are growing in popularity. I would say that most of our clients are seeing tremendous results with in-person or webinar strategies, because that’s when they tend to see or hear a person and connect with them in a human way that starts to build immense trust and starts to get them over that bump of whether they’re going to purchase or not. Douglas Karr: Then we want to look at investment. And we want to try to — I say try because it’s pretty tough — but we want to try to carve out our budget, and we want to understand you know, what is our investment? If it’s a conference that we’re attending, what is the cost of attending that conference and peel that budget off. 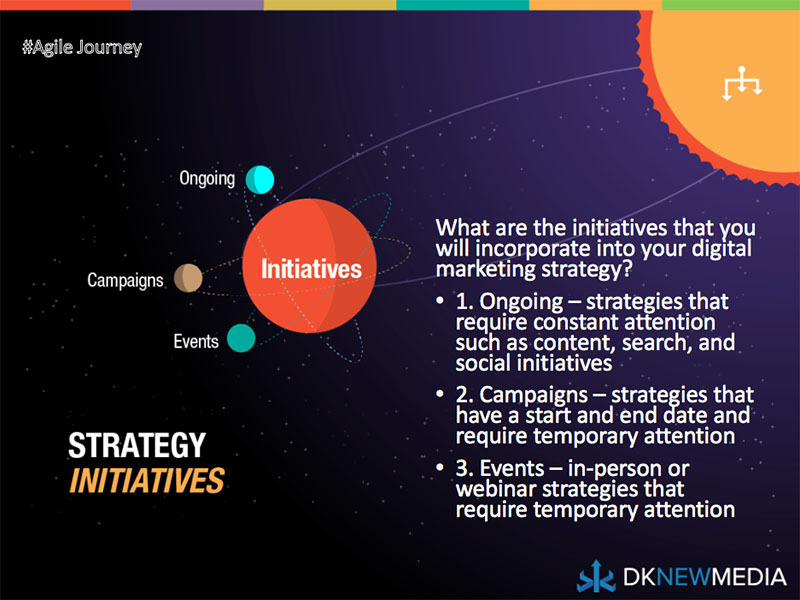 Then we want to look at if there’s ongoing campaigns, what is that? And then we want to look at channels and medium, and understand maybe what we have left, which is typically the result. But understanding how your budget breaks up is really going to help you develop your ongoing strategy, and it’s going to tell you this is what we can achieve or this is what we’re going to have a really hard time achieving. 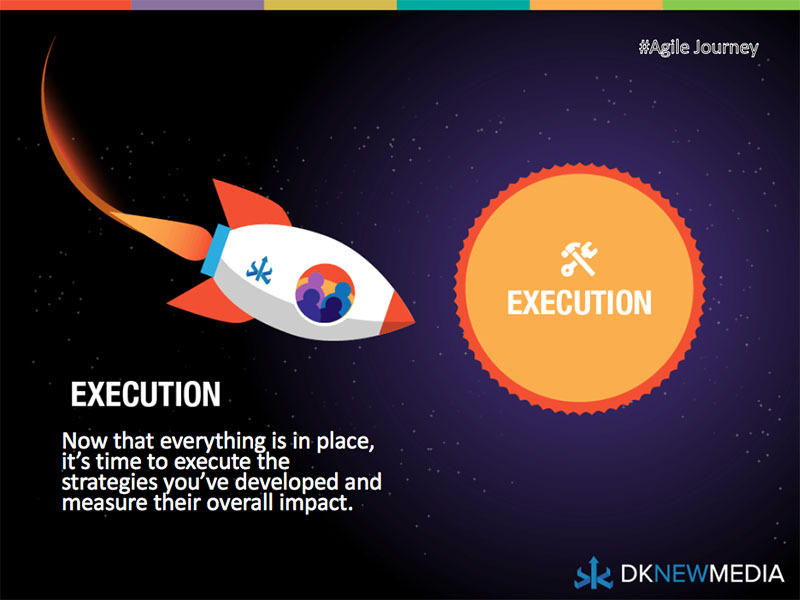 Douglas Karr: The next is implementation — and I want to say implementation is not execution. Execution is actually the next phase. Implementation is making sure that we have all of the things ready for us to execute so that we can measure, test, and have all the information that we need to understand whether we’re seeing success with our strategy or not. So with a clear understanding of the company that we had in the discovery phase — and we understand our market positioning and resources — now we’re really ready to build out that foundation. And so we’re going to make sure that we have the right tools in place; we have the right analytics in place; we have the right dashboards; we have the right assets. All in place for us to get going. Douglas Karr: Now some of these lists are tremendously long that you’re going to see on some of these slides. They’re not meant to be requirements of your agile marketing. They’re just trying to get it across to you that, boy, there is technology out there that we could discover and test and try and learn. And so the first thing when we’re implementing: Obviously, we want the team to be implemented and we want to understand who’s going to do what, when, and how. We want to understand, if you have an agency or a consultant, what their responsibilities are to it. We want to understand our breakdown again of that budget and understand where we’re going to be spending that money on resources. And then we really want to start listing out what are our technologies that we have. We have ad-buying technology, analytics, big data technology, content marketing, CRM, E-commerce, email marketing, marketing automation, mobile marketing sales technology, search engine marketing, social media marketing… The list goes on and on and on. But you really want to identify every single one of those, because when you’re implementing you want to make sure that, okay… I want to make sure that I can have analytics monitor my social media updates that are pushing people to my content that might be landing on my landing page, and I can follow that customer all the way through to a conversion and measure that properly. If you don’t understand the technology that you’re using and the capabilities of it, often times that’s where we see customers — they’re getting leads but they don’t know where they’re coming from or how they’re getting there. Or, they have a system that’s half-implemented. Maybe they don’t have campaign tracking involved in it or some other problem. So they’re having a hard time to track it. We want our mobile channel to be clear. I think for some of our clients we’ve seen in traditional things like… We have a beauty application for stylists… Well, it’s over 95% of their visitors come from mobile. So we have to make sure that everything that we’re doing online we’re absolutely designing for mobile first. And you guys should start to think about that as well, because I think on average over 50% of traffic to websites is now coming on a mobile device. So if you’re running into problems there, then you need to get those fixed. Otherwise, it’s really going to hurt when you start to execute your campaigns. Then of course traditional channels. We are not against. We love digital marketing. And we love the instant gratification and measurement that it can provide us, but we’re not against traditional marketing either. We just want to be able to measure it. Douglas Karr: So again in our implementation phase, if we’re going to do direct mail or we’re going to do TV, or we’re going to do radio, we want to make sure that we have some type of maybe shortened link with campaign URL’s so that we can track people through to a conversion. Then, of course, we want to measure what a conversion is. We want to measure if people convert online for us? Can they actually pay us through a credit card process? Or is this a lead generation-type system that’s going to land in a salespersons inbox or CRM? And are we tracking that properly? Are they coming from referrals, like word-of-mouth or affiliate, or something like that? And can we track those appropriately so that we understand where those leads are coming from? Then of course, upsells. We want to be able to identify that if we have a great marketing strategy in place, like a client education strategy from a content strategy, we want to make sure that we can measure boy that’s … It might not be impacting these other things, but it’s definitely impacting our ability to sell more or increase the value of our customers. Douglas Karr: And then of course we want to get this all working within full reports. We want dashboards, and we want analytics to show us where people are coming from, how they’re getting there, how they’re converting. We want to be able to identify and measure the process, which again you know ClearVoice does a fantastic job of providing you a clear view of where things are within your workflow. We want to be able to re-prioritize and understand what’s coming next or what’s coming last? What’s on a backlog for the future? And we want to identify this with regard to trends. So trends might be… We were working with a home services organization. Well, obviously the trend there is weather and seasonality. And so we want to understand that if they had a 20% dip in traffic, well, was that because of the snowstorm that came in that absolutely cut off calls to their business? Because a lot of times we watch as customers compare month over month, or year over year, and they have significant differences — and they can’t explain that because they’re not monitoring other trending information. Douglas Karr: All right. You guys got this all down pat? You memorized it all? I hope not. But the next and last phase is — now, actually it’s not the last phase but the next phase — is execution. Now we have everything in place, right? We’ve talked about our strategy. We understand our resources. We know our goals. We know our budget. We know all the tools that we have in place. Now it’s time to execute those strategies that we’ve developed so that we can measure their overall impact. Douglas Karr: And so some of those things are looking at different mediums. Textual content like articles, case studies, collateral, sales collateral, customer testimonials, white papers. Audio content is starting to grow in popularity. Things like podcasts and, of course, traditional radio. 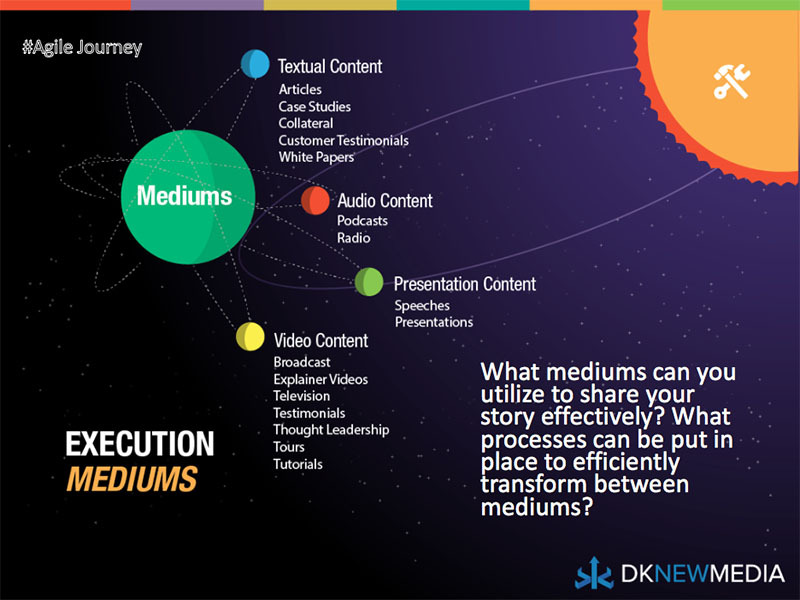 Presentation content like this: Are we doing webinars, speeches, presentations? And then video content, broadcast explainer videos, television testimonials, thought leadership, tours, tutorials. 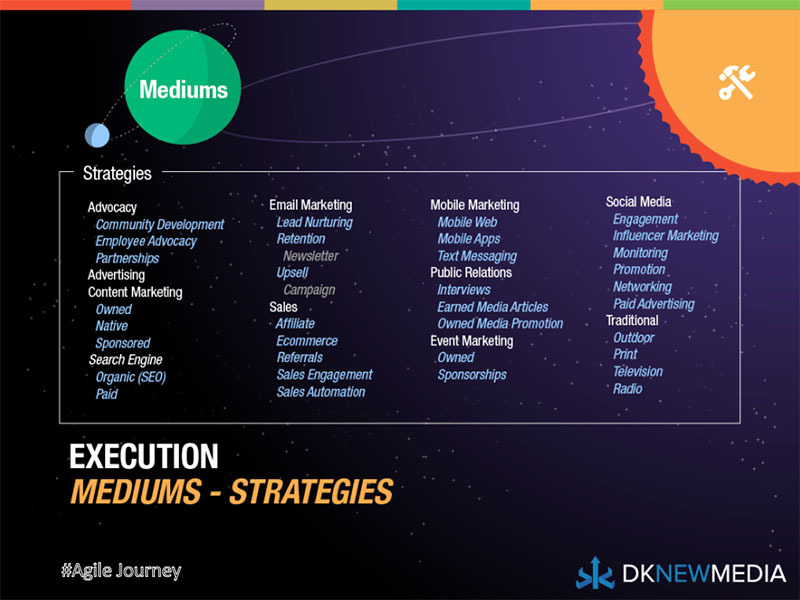 Now the reason why I clump all this together is we want our clients to start thinking not about working on each of these mediums independent of one another, but how can they work together through a workflow. So I’ll give you, for instance, is for one of our clients they’re highly technical and so we record a podcast with them. Then we take that podcast and we get it transcribed. Then we take that transcription and we give it to writers to write it into multiple articles. And then we take those multiple articles and sometimes we do social graphics or infographics with them. Then over time, as we produce more content, we take those articles and we put them into a white paper. So if you’re a resource-shy person and you don’t have a lot of time or a big staff, if you could start to get a production line going where you’re moving one piece to the next to the next to the next, you can have incredible efficiency. I think one of the problems that we tend to see is: Content developers, and if you’re creatives out there, you love to create something that’s new everyday. But the problem is that you’re still talking to the same customers that may be at the same step within their customer journey. And so we want to hit them with the same message at the right time at the right place, and maybe just tweak it and test it to make sure it’s more efficient. So start to think about your content in a different mode. A lot of people look at it from production. Produce, produce, produce, produce, produce and get it out there. We tend to look at content and say, “You know what, what’s the library of content that we need to get out over the next year that’s going to really fill our site and provide every resource to our clients or to our prospects that they’re looking for online?” And then we want to fill out the different mediums associated with that. Of course, we want to look at different strategies, then to produce and promote those. Again this is not meant to scare you, or make you think “Oh my god, we got to do all these things.” But a lot of companies miss opportunities with different strategies within their mediums, and I’ll give you a perfect example. Employee advocacy. Douglas Karr: I was at a major conference for a tech vendor in Las Vegas a couple weeks ago, and they told me that out of all of their employees they had about 10,000 employees online that openly talked about the company as advocates… 2,500 were super active but, interesting enough, with 140,000 employees worldwide, 90% of the social media conversation was happening off the brand pages and on personal pages. So people connecting with people on LinkedIn, Facebook, Twitter, Instagram, Snapchat: That’s where 90% of the conversations we’re having about their company. Only 10% of the conversations were actually happening on branded Twitter accounts or branded Facebook pages. So employee advocacy, especially if you’re a large company, can have a tremendous impact on how your company is viewed. They noticed as soon as they educated their clients on their social media strategy, or their employees on their social media strategy, and provided them tools to go out there and promote content, they noticed an immediate 20% drop in complaints online. That’s because all of a sudden the audience saw that this was a company that had tons of resources out there to help them get things done. So employee advocacy is one of those things that I plug to large companies a lot. Because you have the manpower internally to really make a difference with your audience, and with your community, and to drive promotion that you might have had to spend a ton on from a public relations standpoint otherwise. Of course, we want to look at advertising opportunities, content marketing opportunities, search engine opportunities… Organic searches still continue to provide really highly relevant leads to the organizations that we’re working with. I would only put a caveat out there that over the last few years, maybe five to ten years, we’ve seen a significant change in the complexity of Google’s algorithm for the better and that’s that they’re really focused on getting great premium content and presenting that to their search engine users. What that means is the days are kind of behind of us you know, cheesy back-linking or producing 20 articles a week on different keywords. We are really working with our customers to cut down the volume of content that they’re producing but increase the wealth and richness of that content. So the blog posts that we’re working on have primary and secondary research. They typically have some type of chart or graphic associated with them. They typically have incredible depth and definitions, block quotes, table of contents even sometimes. So the search engines are paying attention to that. You can look at a lot of stats online that talk about the average number of words per page on ranking pages. But it’s really up there. It’s not 200 or 300. It’s 1,000 words a page. And so you really have to start looking at what search engines are doing that’s so important are they’re improving the value of the search results that people are getting. So I want people to write and produce content like they’re marketers. Not like they’re a search engine algorithm. The days of playing with the search algorithm are behind us and now you really have to focus on how are you going to put relevant, attractive shareable content in front of people that they’re going to talk about and share and get out there for you. Email marketing is always a rock-solid foundation for any company but again we work on things with our clients that they might not be able to afford to hire an email team. So what they do is we take and we integrate these tools that take their blog posts, RSS feeds, events, and push them automatically into a newsletter. So that drives people back to the site without adding resources and time associated with it. So for instance MailChimp has an RSS to email feature. It’s pretty good but you can do a number of custom things to get even more content into that email. Then of course sales. Affiliate sales. Referral sales. Sales automation is really growing in its complexity and its offerings. And so this is another one that a lot of people miss the opportunity on, that we have tools like… I don’t know if you’ve ever heard of nudge — N-U-D-G-E — but it’s an AI-driven recommendation engine for keeping in touch with prospects and customers. And so there’s a lot of tools like that out there on the market now that are free or fairly inexpensive that can really increase your efficiency online. And then of course the typical: mobile marketing, public relations. We still love public relations, and we love pitching people on the infographics and content that we’re producing. Event marketing always works. We have owned events like this webinar that ClearVoice is putting on, or we have sponsorships where we’re sponsoring other conferences or in-person events or webinars. Then social media. And with social media we talk about engagement a lot, but I really want people to focus with social media on: Is there a correlation between engagement and conversion? And that’s one of the things that you have to really be wary of with social media. You might have a great following. You might have a lot of eyeballs. You might have a ton of people writing back and forth and asking you questions. The question though is: Is that helping your bottom line? Is there a correlation between those conversations and people actually clicking through for a demo or signing up for your software or buying your product online? Because if it’s not, then you need to shift your thinking as far as social media. Influencer marketing has been taking off like crazy. Again, I keep pointing back to ClearVoice, but ClearVoice and I had a conversation together on how we could help them… And so I have an audience that is marketing technology-related, and ClearVoice is targeting my audience. 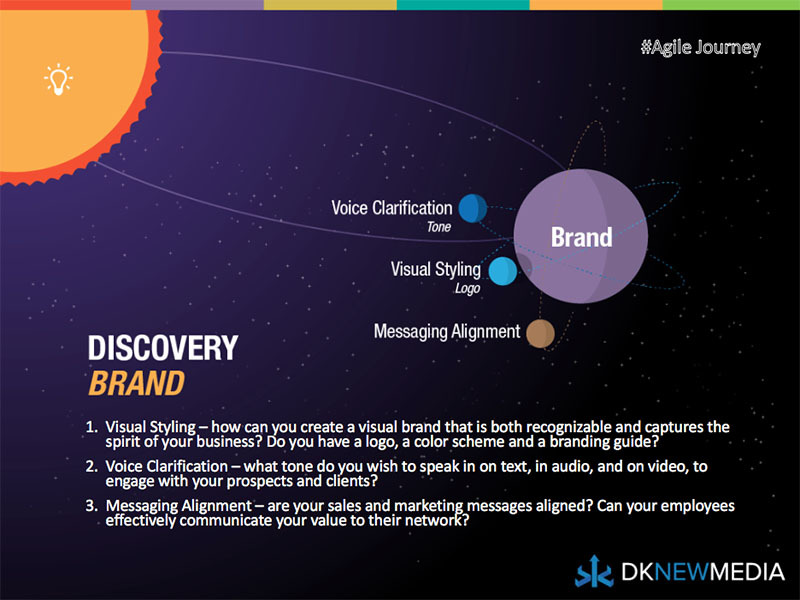 Well what better way than for me to introduce my audience to ClearVoice but provide value through an infographic like this, and this is a perfect opportunity where influencer marketing works. Then of course with social media you want to monitor. You want to create that customer experience. One of the things that we were talking about with a company was they actually created an entire tiger team of people to help with customer issues so that everybody in the company could be an advocate of the company. You could reach out on social media, could help people. But if they didn’t have the resources to fix the problem, they had someone that they could immediately call and turn it over to, to fix that. So social media monitoring is becoming more important than ever. If you’re not responding via social media, it’s a negative. You’re starting to get a hit on your brand, and over time that can really start to wear you down. Then, of course, look at strategies like outdoor, print, television, or radio. We don’t necessarily have a hard time with those, especially nowadays where your inbox might have … My inbox right now is probably sitting at about 250 unread emails. But the mail that I received today… I got three pieces in. So guess what? Which one did I actually spend more attention looking at? And so sometimes there’s an opportunity to utilize traditional marketing in there. One more example: mobile applications. We have a company that they mix chemicals for companies, and so they’re in the chemical business, but there clients are all engineers that make tons of conversion calculations. So we built a mobile app for them that helps them do those calculations a lot easier. And of course, it’s branded well and has a click-to-call button so that they can call the help desk of the company. So here’s something that’s totally outside of their bailiwick. It’s totally out of their focus on buying and selling chemicals, but it’s something that is a technology piece that’s keeping them top of mind with the audience that they’re seeking — and there’s hundreds of examples like this. Douglas Karr: Now the last piece of this is optimization. This is another step that we often miss. And so as I look back and review everything that we’ve been through, what we typically see is people started execution… and they missed those discovery phases… and they missed the implementation phase… and they missed the strategy phase… and they start executing, and then they’re not getting the responses that they expect. They don’t understand why they can’t make adjustments intelligently because they’re not measuring it, and then the worst is they can’t actually optimize intelligently. So after they did what they were executing, they don’t know how to go back and maybe check a landing page and see whether it’s converting well or not converting well. So a lot of companies are again suffering because they’re starting at the execution phase, and then they’re not optimizing because they can’t optimize. So it’s causing all of these problems within these companies, where their marketing efforts are, just 90% of them, are just waste…. And these poor marketers are overworked and they’re just asked to do more and more and more. So my advice to those companies and those marketers is really take the time out. Carve the time out: Even if it means carving out five hours a week to start working on those first phases of discovery, start doing that. And you’re going to figure out, and you’re going to start to be able to build the connection — and you’re going to start to see why things are working and aren’t working. When we have customers that implement like this totally, and they implement an agile process to adjust accordingly, we’re seeing double digit increases in their marketing efforts for conversions and retention. But it’s the companies that we see that just go and do things and they don’t align everything, and they don’t measure anything that we’re really seeing that suffer nowadays. Douglas Karr: So with that, and we have some time here. Hopefully that’s good for you guys. I just wanted to let you know who I was. I run MarTech Zone, if you get a chance go to that site. Sign up for the newsletter, you’ll get a constant drum beat on a weekly basis, or daily basis of tips associated with the tools, like ClearVoice, that are really making a difference in these marketer’s lives and really helping them to automate some of these processes and measure some of these processes. So with that I think we’re going to go into a question-and-answer mode. Meagan DeMenna: Yeah. Thank you so much, Douglas. This has been great. I know this is all stuff that we deal with on a day-to-day basis. So I think this is wonderful, and I love that you really got into the difference between implementation and execution. I thought that was really important and also talking about the quality of content, that you’re not just pushing out content to get it out there. Thank you for saying that. Douglas Karr: It’s a really big problem. I mean we learn from, a lot of the time search engines are the cause of their own problems, but for a long time there Google wanted more content and they just said “Everybody should just produce more, produce more, produce more.” And they kind of educated all of us as marketer’s “Oh my gosh, we just have to produce more.” And then they figured out that more wasn’t better, and now they’ve ratcheted it back through algorithms and now they’re really looking for this premium content but unfortunately companies that momentum are still going in that direction of volume, volume, volume instead of really taking and handpicking what they should be working on. Meagan DeMenna: Right, yeah, and something you actually said is you know, not writing for the search engine but writing just as a human, which I loved that you pointed that out. So. Meagan DeMenna: But before … We do have a few questions. So I just want to mention we have a few minutes before we have to sign off. But if you do have a question for Douglas, we have a few already queued up. Please expand the GoToWebinar chat outlet in the top right of your screen to send in the questions or again you can tweet us using the hashtag #AgileJourney. And so yeah then one of the questions that we got is: Will the evolution of voice search finally cause the death of SEO? Douglas Karr: Oh, that’s a great question. It’ll be an interesting road. I’m always an optimist to say yes, but could that be 50 years from now? And I think what’s happening with search, there’s a convergence happening. For everybody listening, there really is a convergence happening right now and that’s that technology is really advancing a lot faster. People look at the internet and they think “Well, things are just plugging along as they always have.” If you’ve ever heard of Moore’s Law and everything, but there’s actually an acceleration happening right now with technology and that’s that we have a thing called persistent memory that’s going to start taking over which computers are just going to be coming demonstrably faster. In fact, with persistent memory you could literally unplug a server, plug it back in, and it’ll leave right where it left off. And what that’s going to do is: It’s really going to pair down the huge software complexities that we have and it’s going to make it a lot easier to develop really high intelligent robust applications. Now combine that with AI — and so artificial intelligence where we have computers that are starting to learn and develop their own things. Combine that with internet of things and mobile and the fact that almost everything in our lives can be wired and providing feedback, and I really do think that we’re going to reach a certain point where when I ask a question versus when Meagan asks a question… We both might ask the same exact question, but we’re going to get two answers based on what our personalities are and what our likes are and what our dislikes are. And it’s going to be really accurate eventually. And so I know that’s a scary thing to talk about but we are heading in that direction. Now I think the other part that I’ll say is that a lot of the companies that we work with, they are really trying to be that number one search result. So when I ask if I ask my Echo, “Who’s the best content management system on earth?” That’s cool. That’s going to provide an answer and say “This one might be number one” or something. But in all honesty in the B2B space and the B2C space we’re often wanting to do comparison and research online. So we often want the top three or the top four, or even the top of page two sometimes, and so I don’t know that even when we get to a point where intelligent searches can provide the best answer. I still think we’re going to go back and ask for more, and we’re going to do our own research and make our own evaluation. So I hope that was a good answer. Meagan DeMenna: Yeah no that’s a great answer. Thank you. 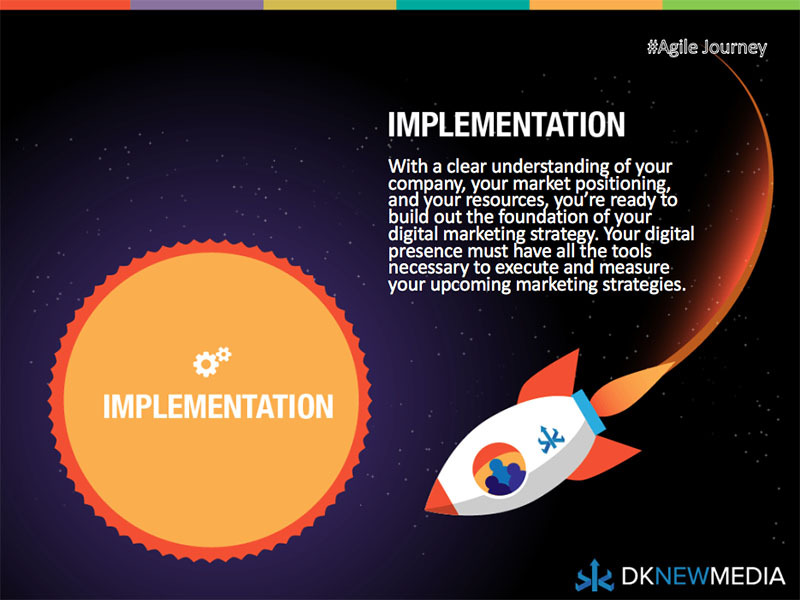 Another question we got was: How did the term “agile marketing” come about? Douglas Karr: Oh I love that question. 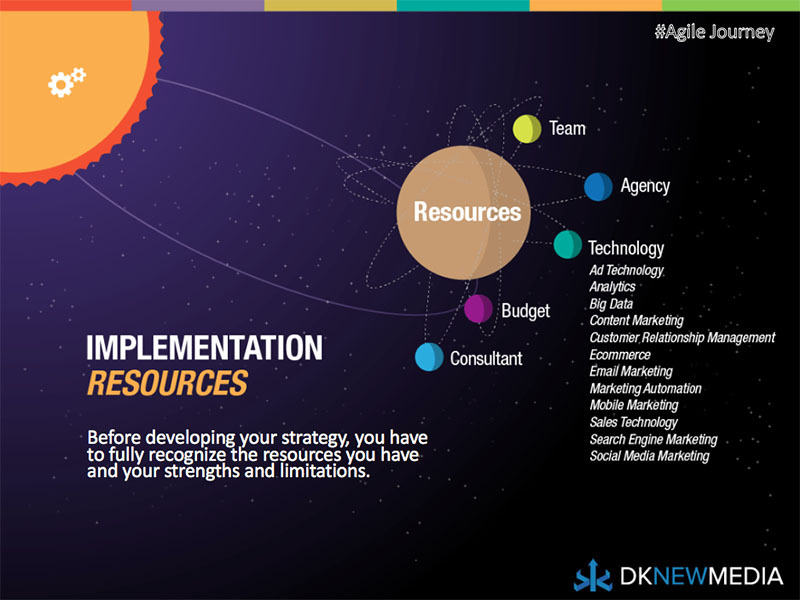 So agile marketing came about through agile development. So there was a problem in traditional software where companies would take entire teams, hundreds of people sometimes and they would develop for three months to put out a release and when they got everything done it went to QA and nothing worked and it was because there was all kinds of people bumping into, their code was conflicting with everybody else’s code. So what companies have basically done from a development standpoint is they’ve started to put these processes into place where daily scrum meetings and they call, you know where you stand up and talk about what you’re working on today and you hear other developers chime in that they can help with that or this is a problem or this is a road bump that you might run into and then they have sprints which is basically maybe on a weekly basis they have goals to get things done iteratively and what they found is over time it really has built these teams into highly functioning performing teams where they didn’t have the traditional top-down leadership where you went to approval to QA to this to that and had all these problems. 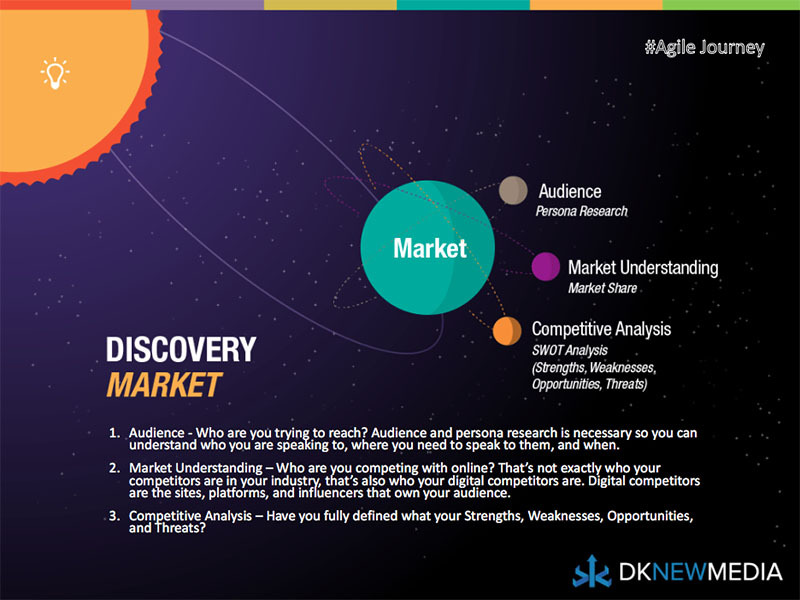 So marketer’s have basically adopted agile as an approach because we run into very similar problems. If you can think about your … You know, five years ago when you were doing a marketing campaign and it went through legal and it went through this and it went through that and you had to change it 15 times and then you know by the time the campaign went out it was terrible and it didn’t perform well. Well we had those same problems where it was kind of committee based marketing that ground everything to a halt. So marketer’s have adopted this strategy as well that, hey, let’s have some singular goals out there, a handful of goals and then let’s work iteratively to attain those goals. But let’s get everybody that we need on a team to work on a daily basis together to bounce ideas off of one another and to get feedback, so that we don’t have to go through this rigorous process that just destroys our momentum. 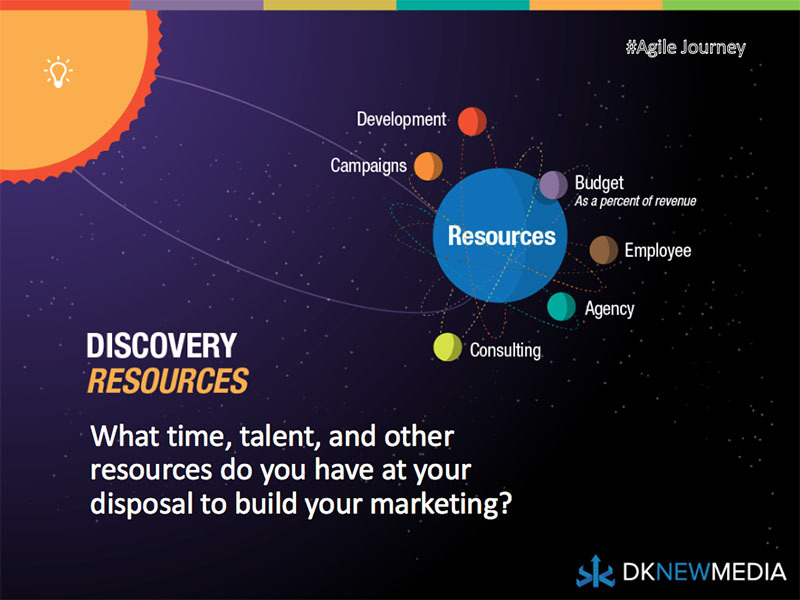 So you can read a lot about agile marketing online, and there’s a ton of tools out there. 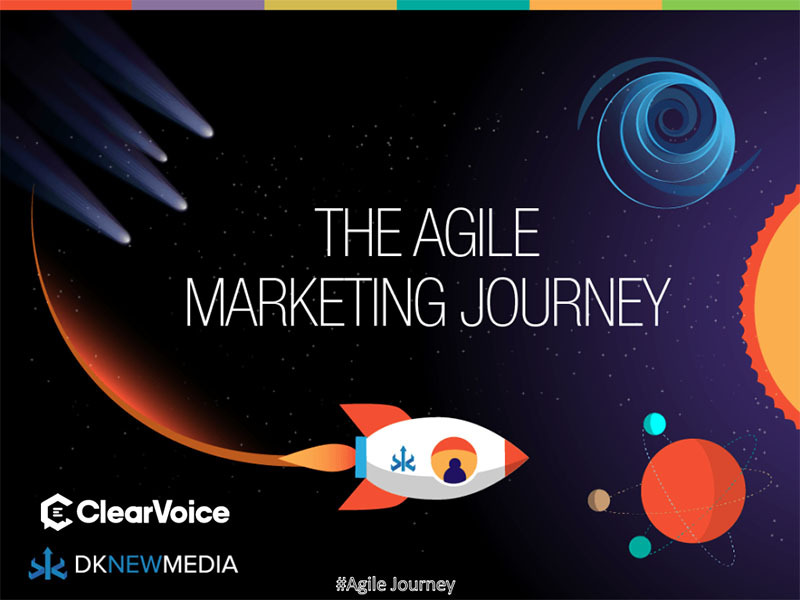 I think ClearVoice obviously has … It fits perfectly with kind of the mandate of an agile process where you’re looking at everything through the eyes of a funnel you know working through to completion, and then being able to measure the results on that. 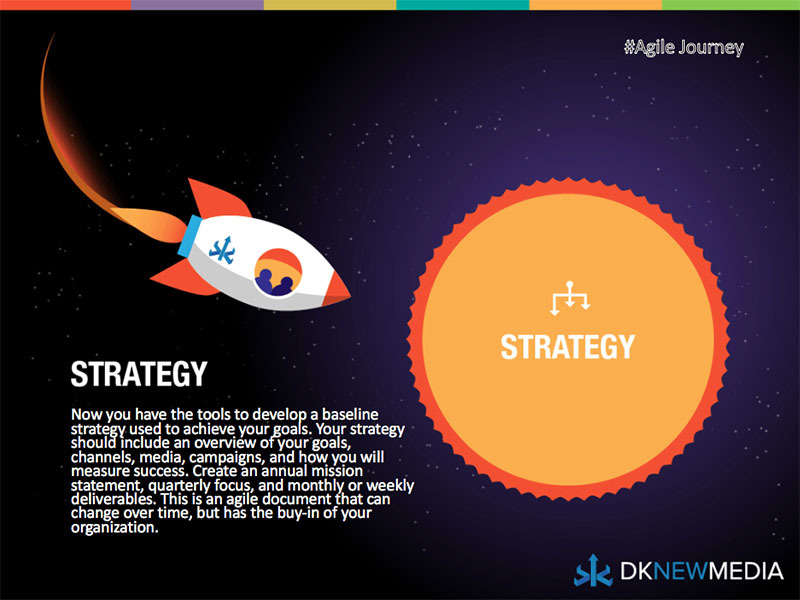 So I would encourage everybody to go get a book on agile marketing and slowly implement it into your companies. Maybe if you’re not a firm believer right now, start one campaign with agile, and eventually I think you’ll just be bought in totally. Meagan DeMenna: Thanks. So piggybacking off of that: Do you have like a favorite story where you’ve been able to implement agile and it saved some sort of campaign you were working on? Douglas Karr: Well I mean my own company it’s absolutely… I mean what we used to do with our company was we used to consult, provide a strategy for a company, run it through their approval process, get feedback, and three months later nothing was ever executed and the client would basically say, “Boy, what have we been paying for for three months? We haven’t even done anything yet.” And so what agile has done for my agency is that I know that there are low hanging fruit that I can immediately execute on the front end of every engagement, you know, that we’re going to start to get iterative results for. And so what winds up happening is: We have these clear communication signals between us and everybody understands if something’s late or things were traded and pushed back and forth, they absolutely understand it — and there’s no that end-of-the-quarter argument when they’re paying the bill. It doesn’t happen because they were along for every decision along the way. Meagan DeMenna: Oh yeah that’s great. Great advice. So we have another question from Milton from Florida: Do you agree that success/experience in today’s age is more important than sales or marketing and why or why not? Douglas Karr: Oh my gosh. Milton, that’s a great question. It’s an interesting one. I’ve actually helped a lot of different, especially software as a service in that field, companies and so I was a part of Exact Target before they sold to Salesforce and then I was a part of other ones and here’s what I can kind of say is that I’ve seen both work really well. So Exact Target was a sales driven organization that pushed the boundaries over and over, bloodied its nose to get to the next phase of it and often times that kind of left the customers, the first customers, kind of left them in the dust. Right? If you’re going after a Fortune 100 company with yours, the Fortune 5000 companies are going to get left behind a little bit. They’re not going to get as much attention. Now did it work in Exact Target’s favor? Absolutely! You know they became a multi-billion dollar company that sold to Salesforce and they were very successful. Now, was it successful in the eyes of those customers that you know weren’t too happy about it, and didn’t get the attention that they thought they deserved? Well, no, it wasn’t. And so I think you can do both simultaneously but maybe not as aggressively as the others. So I love the companies and I made a personal decision with my own that I really want my company to be, my clients to be ecstatic about what they’re getting. And so our oldest client is coming up on nine years now, and he’d trust me implicitly. If I want to go buy equipment and tell him, he’ll tell me to invoice him and everything else. We have that type of relationship. So personally I find working through really great strong trusted relationships, you know, I don’t need to be a billionaire. I’d rather have a happy client and so my measure of success is not in my bank account I guess. Meagan DeMenna: All right. Well, thank you so much for your time. I think we’re going to stop there. And if we didn’t get to anyone’s question today, feel free to tweet them to ClearVoice and Douglas using the hashtag #AgileJourney.